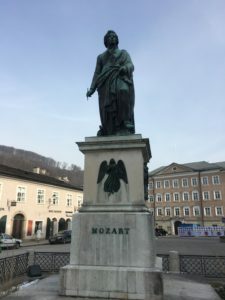 This statue of Mozart stands in the old center of Salzburg, Austria. I probably would not be in Salzburg if it was for my friend, Noemie. I was planning on going to straight to Vienna, but she intended to go to Salzburg before Vienna. I’m really glad that I decided to go her route because Salzburg is beautiful and charming. This is the town of Mozart, and you will see references to the famous composer everywhere. The city center does cater to tourists, but it also provides a lovely walk through tight streets that open up on impressive plazas. The buildings are mixture of alternating colors, soft salmon to light blue, and remind me a bit of Rainbow Row in Charleston, South Carolina. 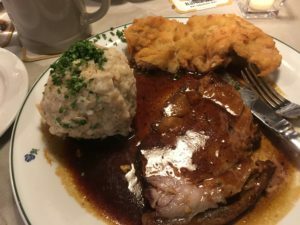 It’s always great to grab a bite to eat before spending an afternoon walking through a city, and we lucked out in finding Wirtshaus Zwettler’s. An American woman from Texas named Melissa was sitting outside with her newborn baby and recommended the special of the day, a pork chop in gravy with a ball that tasted like Thanksgiving stuffing to me. There was also a cabbage and vinegar salad. The wiener schnitzel is on the top of the plate. It’s breaded. I had the special, and Noemie had the wiener schnitzel. We shared. All of it was good, but I have to say that schnitzel was my favorite. The atmosphere in Zwettler’s was pretty awesome too. It’s a little lower than street level, so you descend into it. It has a pub-like feel, and it was full of people eating and drinking. As you walk through the city center of Salzburg, you will constantly catch glimpses of Hohensalzburg Fortress. It looms over the city from a high hill. You can walk to the entrance to the fortress without paying, but, if you wish to tour the fortress, you have to pay. That was the case with a lot of the museums as well. We chose to just stroll the streets. I would like to tell you about a personal interaction that I had with a local, but I must admit that most of the people I saw today were tourists. But, I still feel lucky to have enjoyed a little Mozart on a Sunday. Love Salzburg. I went there 23 years ago with my church choir. We sang in the Duomo for their Sunday service. It was an incredible experience. You have pictures of the interior in this video. Gorgeous.